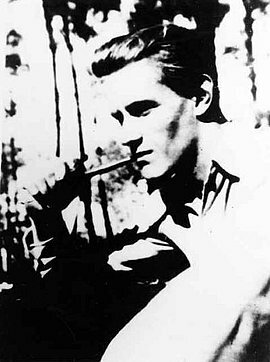 In February 1934 the communist Eugen Schönhaar was murdered in the Gestapo prison in Prinz-Albrecht-Straße in Berlin. By this time his nine-year-old son Carlo and Carlo’s mother Odette were safely outside Germany at his grandparents’ home in Lausanne. The family had to leave Switzerland shortly afterwards and went illegally to France. Carlo Schönhaar was initially able to continue his schooling in southern France. From 1941 on the family lived in Paris, where he attended high school and made contact with the French resistance movement. He joined the Bataillons de la Jeunesse (Youth Battalions) and was expelled from school after a strike. In March 1942 Carlo Schönhaar was arrested in Paris with some of his French friends and put on trial. The group, which had planned an action against a National Socialist propaganda exhibition on the Soviet Union, was exposed by Gestapo informers. The Court Martial sentenced all the accused to death. At the age of 17 Carlo Schönhaar was murdered on April 17, 1942 with his French friends at Mont Valerian in Paris. His mother Odette, who had also joined the French Résistance, was taken into custody four days after her son’s arrest. She was brought to Germany from the Gestapo prison in Paris and eventually liberated from Ravensbrück concentration camp in May 1945.